A vast and silent landscape nestled amidst rugged mountains and lush woodlands. Its ancient roads, abbeys, forts, monasteries and the suggestive medieval villages still echo with the footsteps of legendary peoples: the Sabines, the Romans, the Longobards, the Franks, and all those who, from the Middle Ages to the Renaissance until the present day, contributed to make these places unique. Even today the area offers the visitor a journey back into history and stories about religious devotion and ties to the land, told by the old, wise and melancholy, who keep the oral tradition alive. The street processions on Good Friday, the blessing of the fields on Ascension Day and the feasts held in honour of the patron saints mark the life of a people who still keep their own traditions alive and celebrate their past culture. This picturesque place is situated in an unspoilt countryside, characterized by lush woodlands, towering mountains, yet ready in offering the visitor access to its ridge, impressive sinkholes, herbal grasses, corn and barley fields which are cultivated according to the local rural tradition. In the heart of this place, hidden by tangled and untamed woodlands, wolves, deer and martens move stealthily around. Set in 140 hectares, Ocre perches on the north-eastern slopes of Monte D’Ocre (2206 mt.) and is part of the Parco Naturale Regionale del Sirente-Velino, instituted by Abruzzo region in 1989. The name of the town, Ocre, derives from the old Greek termocrìs (i.e. rugged) thus emphasizing its high and defensive location. From its commanding position, Ocre overlooks the Middle Valley of Aterno and such defensive position is highlighted by the presence of two valuable artistic monuments, the Monastery-Fortress of Santo Spirito (XII c.) and the Castle. Built in 1222 by Beato Placido of Roio on a piece of land donated by Count Berardo of Ocre, the Monastery is the third Cistercian settlement, in order of foundation, in the Abruzzo region and the first in the Valley of L’Aquila. The Castle, mentioned for the first time in 1178 in a document issued by Pope Alexander III, is the suggestive evidence of a defensive and strategic architecture in a territory that played a decisive role during the Late Middle Ages. 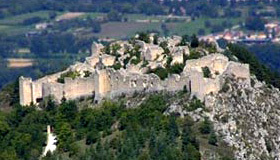 Destroyed in 1280, the Castle was rebuilt and in 1424 became the scene of the exploits of Fortebraccio of Montone. Today we can still admire its impressive walls strengthened by seven towers, the best preserved in Abruzzo, covering a 470 mt. perimeter. Historically, the town of Ocre has always comprised of 5 “ville” (hamlets): San Panfilo, seat of the town hall, San Felice, San Martino, Valle and Cavalletto; a mosaic of old stone houses, charming views and sloping lanes suddenly vanishing into secret gardens. As regards its origins, the discovery of some inscriptions, between Valle and San Felice, suggests the existence of a settlement of the Vestini, an Italic population that inhabited the Abruzzo region before the Roman arrival, even though the existence of Ocre is documented only after the middle of the XII century. The three most suggestive monuments in Abruzzo, the Castle, the Monastery-Fortress of Santo Spirito and the Convent of Sant’Angelo that from its breathtaking heights overlooks the Valley of Aterno; a minor artistic heritage, including 13 churches scattered all over the territory where the works of famous artists are kept, such as Francesco of Montereale and Saturnino Gatti, make Ocre a unique destination for a relaxing and charming stay.